Alerts are now available for Web Sites and SQL Databases, in addition to Cloud Services, Virtual Machines, Mobile Services, and Storage. Create alerts for Web Sites based on any metric in the portal, including errors, CPU time and total requests. 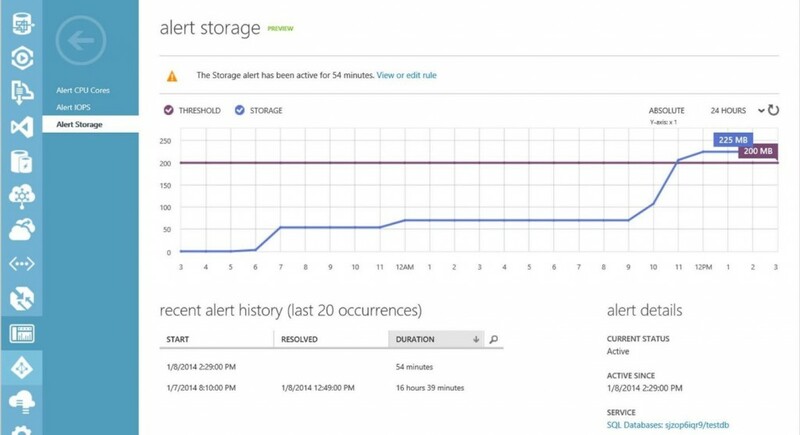 Create storage alerts for Web and Business tier SQL Databases, and CPU Cores and IOPS alerts for SQL Database Premium (Preview). To get started with Alerting, click on the Management Services extension on the left navigation tab of the Windows Azure Management Portal.